Looking for more family space in your home? Don’t begin by thinking you need to create an expensive addition to the house, look at what’s below ground level first! 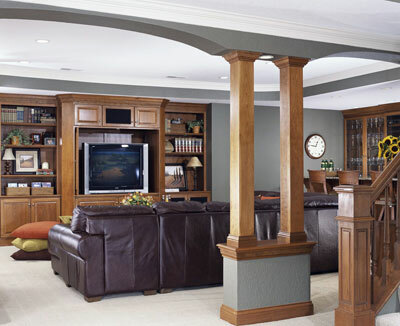 Gain valuable living space by finishing or remodeling your basement. The remodeling experts at Better Homes and Gardens® have valuable tips and cost-effective strategies to remodel your basement. If your unfinished basement suffers from dim lighting, damp air, and ice-cold floors, make the switch from "creepy to cozy" by addressing basement ills and investigating code requirements before you make any other steps in the remodeling process. Taking time to address issues now will ensure remodeling success in the long run. First, learn to spot, identify the cause of, and clear up moisture problems – one of the most common basement ills. Then think of dealing with possible asbestos, mold, and radon. (You may need to refer to a professional to help with these problems.) Taking time to solve these problems first will lead to a more comfortable and safe family environment. 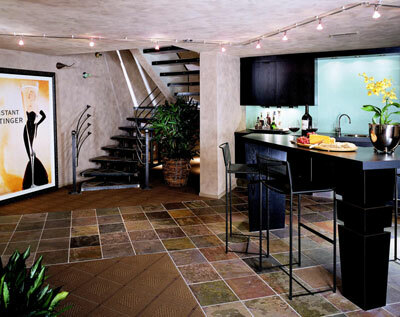 Establishing clear goals for your basement project is the key to a successful design. Set primary goals by determining how each person in your family will use the space. The more precise the goals, the more likely the final design will meet your expectations. To help you determine what you want and need, answer the following questions. How much time would you and your family like to spend in your basement? What will you do when you’re there? Would you like to read, play games, watch television, work on craft projects, run on the treadmill, or operate your business? Would you like it to serve multiple functions? Who’s in the basement with you? Children, friends, family, or clients? What elements will make your basement most comfortable to you? To others? How would you like your basement to make you feel when you’re in it? Relaxed? Energized? Entertained? Will part of your basement serve as storage space? If so, what items will you store? When you’re in the basement, do you want everything you might need within easy reach? Or are you OK with running upstairs for a drink, a snack, or other items? Do you prefer intimate rooms with specific functions or would you like an open, easily accessible floor plan? How much money are you willing to spend for remodeling? Creating your dream basement is in the details. Give yourself permission to create a wish list. With careful planning you may be surprised at how many of your dreams can become reality while you remain true to your budget. As you consider how you would like to use your basement now, think about how you might want it to function in the future. What is your lifestyle like today? How about 5, 10, or even 20 years in the future? At the moment you may need short-term housing for a young adult child who has moved home for a period of time. But what can you include in your design plan now that will make that same space work a couple of years down the road when your child is no longer living at home? Identifying what you can put in place from the beginning may save you time and money in the long run. Occasionally posts, ducts, pipes, and other obstacles complicate basement plans. Carefully map the location of obstructions on your plan. Moving a partition wall a couple of feet, for example, may allow you to incorporate a structural post within the wall, camouflaging the pole. Locating a half bath next to a furnace may allow you to build a single partition wall that encloses the bathroom and creates a closet to hide mechanical equipment. You’ll save time and money by working with and around these obstructions instead of moving them. Though you’ll likely make numerous changes to the floor plan, you’re probably already thinking about ways to position furniture in the space. Here are some suggestions for arranging rooms and furnishings. Direct traffic. If traffic passes through a room, it doesn’t have to run through the center. Think of your furnishings as walls or guideposts that can funnel traffic. Float furnishings. Pull pieces away from walls into close-knit groupings with major seating no more than 8 feet apart. Keep convenience within reach. Include a handy resting place, such as end tables or short storage cabinets, for drinks or books near every seat. Maximize a small room. Use a large-scale piece, such as an armoire or a substantial sofa or loveseat, to anchor the room. Use vertical storage in tight spaces. Fix low ceilings. "Raise" a low ceiling by drawing the eye upward with floor-to-ceiling window treatments and tall furniture, such as an armoire. Direct traffic away from any low-hanging ceiling obstructions. Hiring a general contractor to complete your entire basement remodeling is the most comprehensive approach to getting your renovation completed – but it’s not the only option. You may choose to do some or all of the project yourself depending on your skills, time, physical abilities, and budget. It pays to consider these alternatives to hiring a general contractor before you begin. If you have the tools, skills, time, inclination, energy, and physical ability, you can save a lot of money by doing much of the work; but before you tear into a big project, do an honest self-assessment. Total the cost of the additional tools, if any, you’ll have to buy or rent to get the project done. Account for the time it will take you to order and pick up materials and learn techniques. If you plan to take time off from work to complete the project, compute the cost of lost earnings. Then consider the cost of a potential mistake in both time and money. Miscutting a piece of drywall may cost a few dollars in wasted material and a few minutes of time (if you’ve purchased an extra sheet or two for such a situation). Miscutting a piece of sheet vinyl flooring or expensive carpet might cost a lot more. Wrestling with heavy materials or trying to work long hours to maintain a schedule sometimes can result in injury, an even greater cost. It actually may be cheaper and less risky to hire out some jobs, such as laying carpet or sheet flooring, or extensive wiring or plumbing modifications. Hiring out allows you to concentrate on jobs that better suit your skills, physical condition, confidence level, and available tools. Manage the materials. Order, purchase, and arrange delivery of supplies yourself. Be a laborer. Do work that requires more labor than materials and skill, such as demolition, excavating, insulating, and painting. Do the costly work. If you have the skills and tools, and if code allows, tackle the plumbing or electrical tasks, and leave less specialized efforts to others. Be an apprentice. Ask your contractor to leave minor jobs, such as daily cleanup, for you to do. Provide a spot for children to play, teenagers to hang out, or the whole family to gather with a basement play space. If basement space is tight, elements of a game room are easy to integrate with other functional spaces, such as family rooms, entertaining areas, or creative spaces. A children’s playroom might include a spot for playing with blocks, dolls, and other toys on the floor; a corner filled with items for dress-up; and a kid-size table for crafts. For older children, include comfortable seating, a television and game station, and a desk or table for doing homework. If your kids are old enough, let them have a hand in selecting color for walls, furnishings, and decor. Infusing the space to match their tastes is one way to ensure kids will spend time there. When creating a special area for children’s play, also consider these suggestions. Safety. Make sure the game/play area features an egress window or other exit. Materials. Choose durable, easy-to-clean wall and floor treatments. If children sprawl on the floor to play or watch television, consider carpeting or rugs. Fun. Paint one wall with chalkboard paint so the younger kids can write and draw on the wall with chalk, or install an erasable marker board. If space and budget allows, invest in a pool table, ping-pong table, or even a pinball machine. Family member of all ages will have years of fun with these items. Inspiration. Stimulate play with high-contrast color schemes. Black and white or vibrant, opposing colors are energizing. In the end, don’t forget lighting. Recessed lighting is popular for low ceiling areas. And then invest in lamps and wall scones. The brighter the basement space usually leads to more time spent in the space. Remodeling your basement is a cost-effective option to moving to a larger home. So look below ground and change "creepy to cozy".